Just minutes ago, the Real Housewives of Orange County star Kelly Dodd made a shocking announcement on her Instagram page, revealing she won’t be returning to the Bravo series next year. Kelly’s surprising exit came just over a day after she revealed she won’t return to the RHOC next season unless Bravo fires the show’s OG Vicki Gunvalson. The reason? Vicki made a startling accusation against Kelly on the upcoming RHOC reunion, accusing the 43-yr-old mom of one of using cocaine. “Yep!” responded Kelly on November 22. Minutes later, Kelly reaffirmed her comment by telling another fan that she refuses to work with someone like Vicki. “They can have her… I can’t work with a person like this,” wrote Kelly. 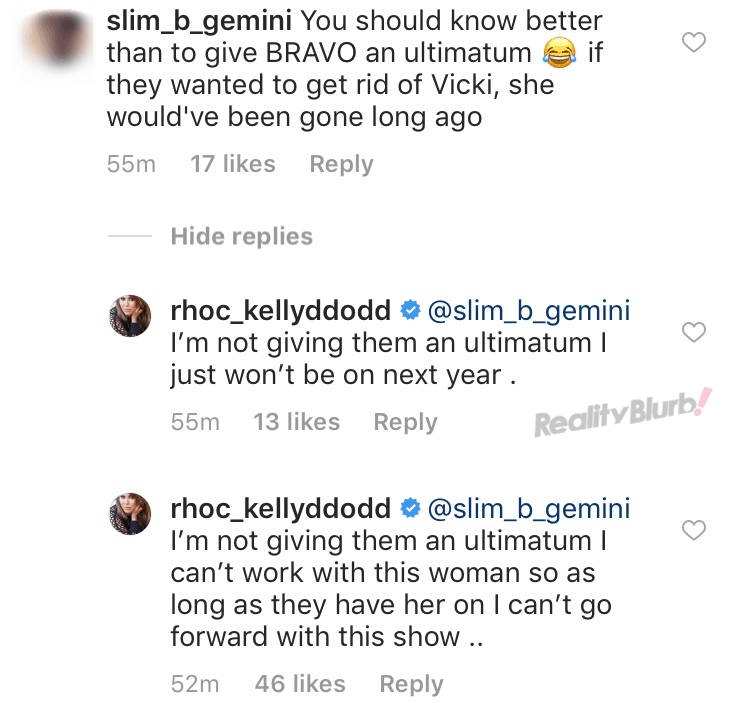 When another follower accused Kelly of attempting to give the Bravo network an ultimatum when it came to her and Vicki, Kelly denied this and further confirmed she had no plans to appear on the RHOC next season. “Like I said to [you] before Kell. It’s actually impressive how she remains two faced despite cutting one off…” wrote Gina, seemingly referencing Vicki’s facelift this season. As for Gina’s beef with Vicki, Vicki appeared to turn on Gina towards the end of the season after her fellow tres amigas members – Tamra Judge and Shannon Beador – started to take issue with the New York native. Additionally, Kelly gave an interview to PEOPLE late Wednesday in which she opened up about why Vicki’s comment was so hurtful. According to Kelly, she’s really upset over it because it has affected her 12-yr-old daughter Jolie. 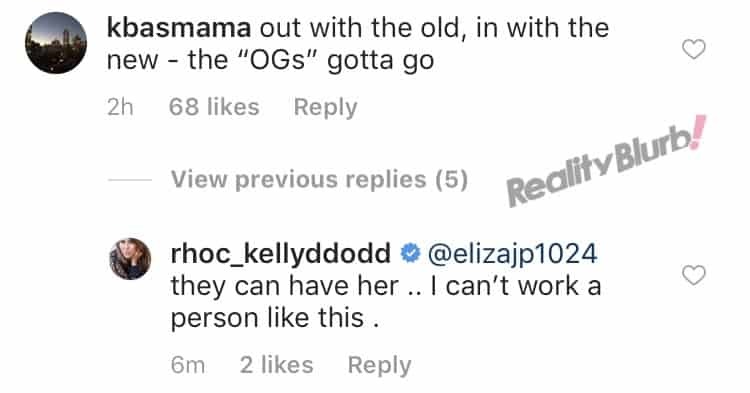 Kelly also admitted that she left the reunion on good terms with Vicki, but added that seeing the reunion trailer which highlighted the drug accusation brought back all the negative feelings. 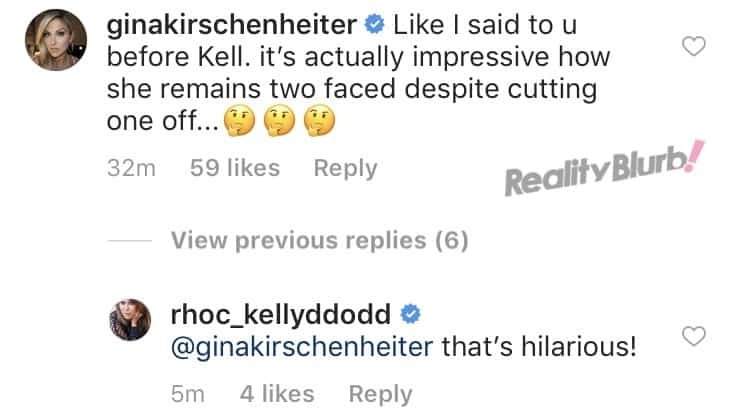 Back on Instagram, when one of Kelly’s followers pointed out that she has also said shocking things about her castmates, an example of this is Kelly having to apologize and retract a defamatory statement she made about Heather Dubrow’s husband Dr. Terry Dubrow’s medical practice last year, Kelly insisted she has never crossed the line. “You’ve said worse things to your castmates. You’re not innocent. Stop being dramatic,” said that follower to Kelly. “I don’t make up lies! !” Kelly fired back. Now, it is possible that Kelly might simply be saying this out of anger and could still end up returning to the O.C. Housewives next season. She wouldn’t be the first Housewife to do such a thing. Last year, LeeAnne Locken announced she was quitting the Real Housewives of Dallas only to later have a change of heart before filming on season three started. While Kelly’s future on Bravo remains up in the air, what is clear, courtesy of our unscientific poll from yesterday, is that viewers would love for her to remain on the series. Bravo has yet to comment on Kelly’s announcement.